Bright, fresh flavors star in this holiday salad. Bring 1 cup orange juice to simmer in heavy small saucepan. Remove from heat. Mix in dried cranberries. Let stand until softened, about 30 minutes. Drain well; discard soaking juice. Place greens in large bowl. Toss with 2/3 of dressing. Divide greens among 6 plates. Add orange segments to bowl; toss with remaining dressing. 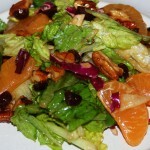 Top salads with orange segments and pecans.